A quartz crystal microbalance (QCM) is typically used to monitor the vapor deposition of organic materials, and QCM sensors feature a quartz crystal disc with a resonance frequency of 5 or 6 MHz.When a metal or oxide film forms on a sensor, the rate at which the material adheres varies little. When an organic film forms on a sensor, however, the rate at which the material adheres varies considerably. This causes a problem since it greatly reduces the life of the quartz crystal disc.The current work used several quartz crystal discs with different fundamental frequencies to measure electrical and temperature characteristics during formation of an organic film. Results indicated that a quartz crystal disc with a resonance frequency of 4 MHz or lower was better suited to sensing vapor deposition of an organic material than a disc with a resonance frequency of 5 or 6 MHz. A quartz crystal microbalance (QCM) is a device to readily detect minute changes in mass with a simple device in which a quartz resonator serves as a sensor. A QCM allows measurement in both the gas phase and liquid phase, so the technique is widely used in sensors like gas sensors, film thickness sensors, viscosity sensors, and chemical sensors and biosensors to measure the interaction of biological substances like DNA and proteins. In the past, a vapor deposition monitor based on a QCM typically featured a quartz crystal disc with a resonance frequency of 5 or 6 MHz. A vapor deposition monitor based on a QCM is used to monitor the rate at which an organic material is deposited during the fabrication of organic electroluminescent devices. When a metal or oxide material is used, the measured rate at which the material adheres to the quartz crystal disc in the QCM varies little. When an organic material is used, however, the rate at which the material adheres to the quartz crystal disc (i.e. 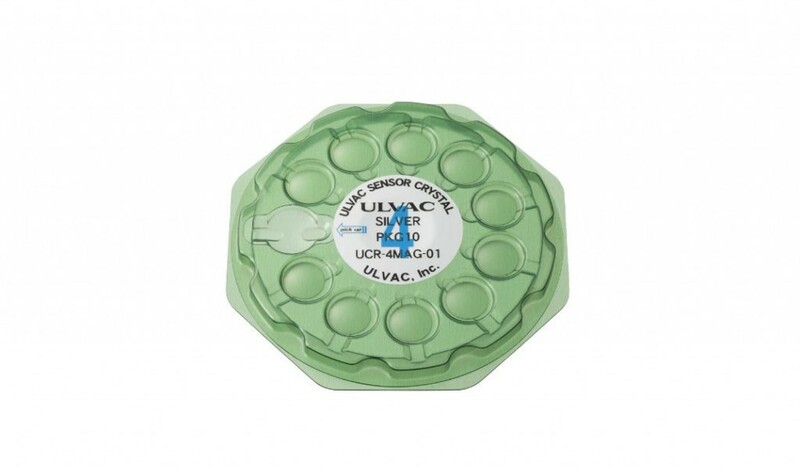 the sensor) varies considerably with just a slight amount of material adhering to the disc. This necessitates frequent replacement of the quartz crystal disc. In order to examine the causes of this variation in material adherence, the current work used several quartz crystal discs (i.e. sensors) with different fundamental frequencies to measure electrical characteristics – in the form of equivalent (series) resistance and the amplitude of the half-frequency – during adherence of an organic material. 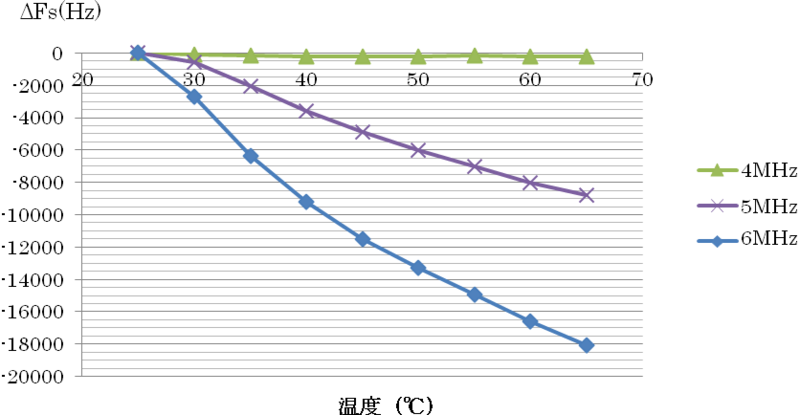 This work also measured temperature characteristics and changes in frequency due to thermal shock during adherence of that material. The organic material deposited was Alq3, which is commonly used in electroluminescent devices. The SATELLA system (ULVAC) was used to deposit the film.The quartz crystal discs used were AT-cut discs with an outer dimension of 12.4 φ and a resonance frequency of 4 or 5 MHz and an AT-cut disc with an outer dimension of 14 φ and a resonance frequency of 6 MHz.The CRTM-9200 deposition controller (ULVAC) was used to monitor film thickness.A 30-W halogen lamp was used to measure thermal shock, and temperature characteristics were measured using a Peltier temperature controller.Electrical characteristics were measured using an R3754A Network Analyzer (Advantest). When an organic film of 60 μm was formed on quartz oscillators with a fundamental frequency of 4, 5, or 6 MHz, the equivalent resistance R1 and ΔFw were measured with the Network Analyzer. The resulting measurements are shown in Figs. 1 and 2. 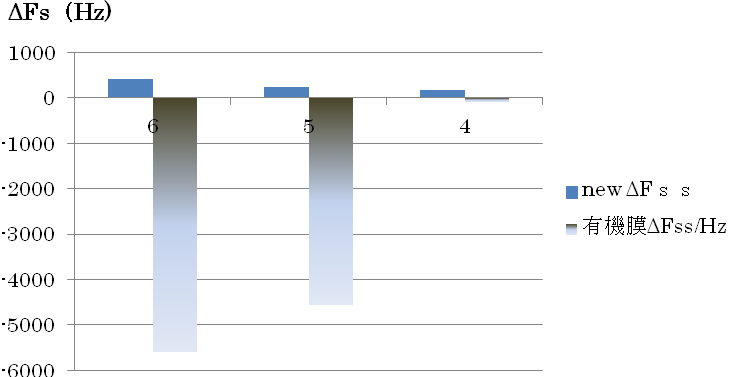 Figure 3 shows the temperature characteristics for discs with different fundamental frequencies when an organic film of 60 μm was formed, and Figure 4 shows the change in frequency due to thermal shock. A lower equivalent resistance and a smaller half-amplitude frequency are preferable when a film is formed on a quartz crystal disc. Thus, a quartz oscillator with a fundamental frequency of 4 MHz or lower is better at monitoring the formation of organic film than a quartz oscillator with a fundamental frequency of 5 or 6 MHz. 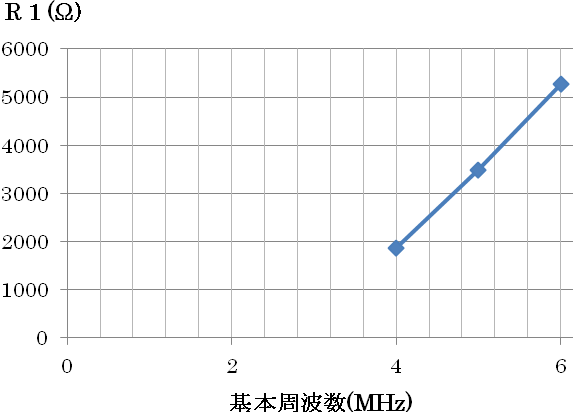 oscillator with a fundamental frequency of 5 or 6 MHz. Quartz crystal discs with a resonance frequency of 5 or 6 MHz have long been used in a QCM to measure film thickness. When measuring an organic film, however, a quartz crystal disc with a low resonance frequency (i.e. 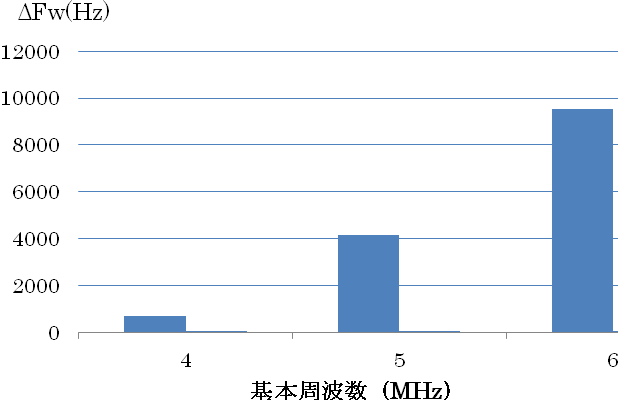 a frequency of 4 MHz or lower) is better in terms of a more consistent rate of deposition, a longer life, and better temperature characteristics.